Nina Kraviz launches her трип (pronounced ‘trip’) label with a double-EP compilation entitled ’The Deviant Octopus’, featuring a pair of brand new productions from Kraviz alongside material from Terrence Dixon, emerging talent Parrish Smith & Bjarki, and veteran producers Exos & Steve Stoll. The idea for трип has been gestating for some time with Nina Kraviz, an avid crate-digger and frequenter of numerous second-hand record stores, who has long wanted to begin a label of her own which would build on some of the principles of her beloved 90s techno labels in terms of attitude and aesthetics, whilst looking for forward-thinking modern productions that reflect her core tastes for idiosyncratic electronic music. The art and title of 'The Deviant Octopus' comes from a single-sentence scenario dreamt up by Kraviz: “Without a moment's notice an Octopus appeared and devoured everyone in sight”. Supplied with this scenario, artist Tombo rendered his own unique visualization for the artwork that adorns the release sleeve. It's Kraviz's own nod to the labels that inspire her and grab her attention while digging through second hand records, the best of which were imbued with the unique personality of the people behind them. 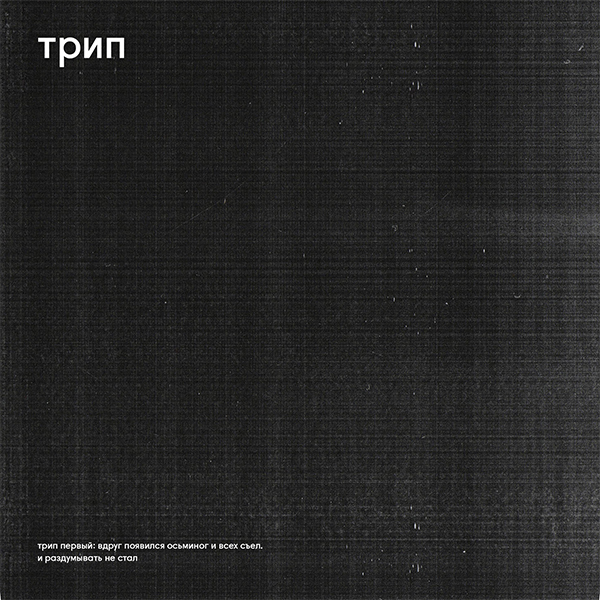 This extends to the sound Kraviz intends for трип: dusky, divergent and trippy music to stimulate brains, dreams and fantasies. In this respect ‘The Deviant Octopus’ is a perfect introduction: Kraviz herself is represented on the tracklist by two new tracks that take up the mantle of last year’s Mr Jones EP by returning to the vocal-flecked hypnotic techno that marked out that release. Complimenting those are two new cuts from a true master of hallucinatory off-kilter techno, Terrence Dixon in his Population One guise. Joining them will be a pair of names from the techno pantheon who have been huge influences on Kraviz: with a career that’s taken in releases on Synewave, Trax, Novamute and Richie Hawtin’s early-90s Probe Records, Steve Stoll has been mining his own variant on techno and acid minimalism for over twenty years, heading up the Proper NYC label and releasing under various pseudonyms, such as Cobalt, of which Kraviz has been a long-term fan. His counterintuitively titled ‘Pop Song’ sits alongside a 13-minute 90s techno excursion from Reykjavik’s Exos - the only previously-released cut (originally appearing on Thule Records sub-label Plast Trax in 1998) - together illustrating that трип will also live up to its name in the geographical sense: showcasing great music from historically vibrant electronic music scenes outside of the usual Detroit-Berlin axis. With Kraviz looking to build a small repertory of talent around трип, this first release also makes room for two newer names: Bjarki is an Icelandic talent to keep a firm eye on, who drew Kraviz’s attention in a chance meeting after a gig at Copenhagen’s Culturebox club, after which he passed her a collection of mind-bendingly odd demos; while Parrish Smith is a talented Netherlands-based producer whose short yet impactful sketch ‘1.0 / 8.0 Afrika Genocide’ brings the second 12” to a bewitching close.